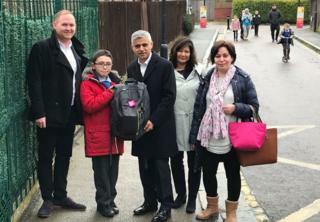 Schoolchildren will carry backpacks with inbuilt air quality sensors to help monitor levels of pollution in London. Some 250 pupils from five primary schools across the capital will wear the bags to and from school for a week. The inbuilt sensors, which weigh about 1kg, measure particulate matter and nitrogen dioxide (NO2) levels. London mayor Sadiq Khan said the scheme was the sort of "bold and innovative" action needed to tackle air pollution. Data collected by the sensors will be used by scientists to discover pollution hotspots, to help children avoid particularly toxic routes to school. Mr Khan launched the project at Haimo Primary School in Eltham, one of the five schools taking part. The other schools are in Southwark, Richmond, Haringey and Hammersmith & Fulham. Mr Khan said: "London's toxic air is harming the lung growth and health of our young children, and we are determined to do everything in our power to protect them." "An issue this large and complex requires bold and innovative action to protect future generations and ensure our children breathe cleaner, healthier air." Kate Barnes, head teacher at Haimo Primary School, said her pupils "work hard to promote and campaign for changes that support a healthy lifestyle for themselves, our community and beyond". "Our focus on air quality has developed their understanding of social responsibility, not only for themselves, but for future generations," she said.